Sandwich shops, takeways, coffee shops and restaurants are always looking for new ideas to brighten up Christmas lunchtimes, so we’ve made The 6 Sandwiches of Christmas to give you some ideas. 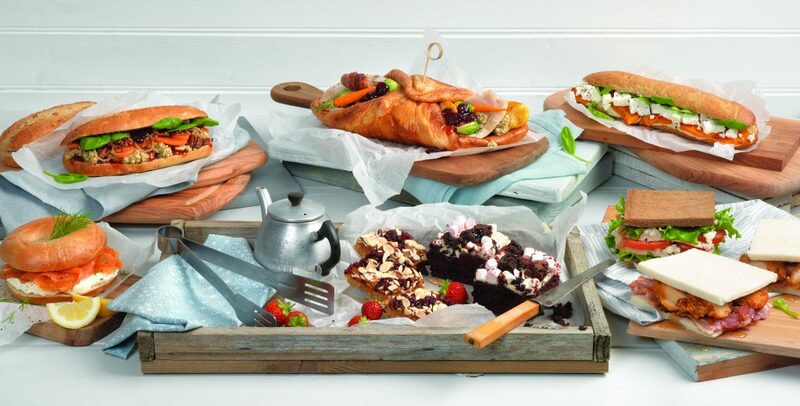 We have a wide range of products to help you entice those customers with a festive buttie. Everyone loves a festive wrap! We used our Roberts Square Yorkshire Pudding (206027C) to give this wrap a point of difference. Filled with Cooked Sliced Turkey Breast ( 1000379), accompanied with our Pioneer Pigs in Blankets. We included brussels sprouts and baby carrots, served with Paxo Sage & Onion Stuffing (303087S) and of course Chefs Selections Cranberry Sauce (307108S). Don’t forget the vegetarian option. For a vegetarian option, we can recommend our Planete Pain Herb Panini (202572C) filled with roasted pumpkin (500214C – fresh) and feta cheese (308683C), fresh spinach (500154C) and tasty houmous (303413C). 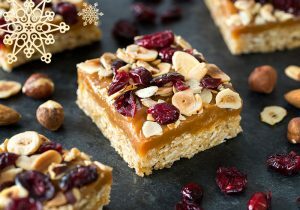 try Traybakes Caramel & Cranberry Flapjack (307678C).